Lower Wortley Primary School implemented the Talk for Writing approach to teaching English from January 2016. Below are more details about what this approach entails and why we adopted it. Talk for Writing enables children to imitate the key language they need for a particular topic orally before they try reading and analysing it. Through fun activities that help them rehearse the tune of the language they need, followed by shared writing to show them how to craft their writing, children are helped to write in the same style. Schools that have adopted the approach have not only increased their children’s progress but have found that both children and teachers love it. To launch our new approach for English we held a special writing event on Wednesday 16th December 2015. When the children came to school in the morning they discovered that Jack Frost had visited and 'frosted' several areas of the school!! The children produced some fantastic writing about this exciting and unusual event. To see some photos of the event please click here. The Talk for Writing approach was develop by Pie Corbett, an educational writer and poet. He is well known for promoting creativity in the classroom and has experience as a teacher, head teacher and OFSTED inspector. 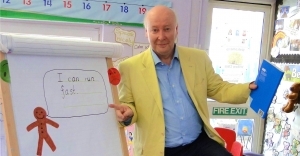 He regularly lectures on education around the world and the UK government consult with him as an educational advisor. The video below is of Pie Corbett explaining more about Talk for Writing. Please follow the links below to learn more about which texts the different year groups and classes will be following.